Youngest brother of Frank Gooding, Walter served as the city’s first mayor. He was an entrepreneur with business holdings in Gooding and Ketchum. He also had the distinction of having had "the most children who lived to maturity" of all the Gooding siblings. This is a suite composed of two sleeping rooms from the early days. 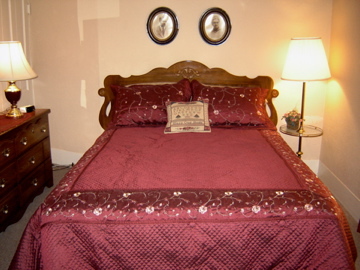 In one room is a comfortable queen-sized bed, a large reproduction dresser and mirror, side table and closet. In the other room is an inviting sitting area with a vintage rocker, a loveseat which converts into a twin-sized bed, and a table and chair set, making it perfect for a family or business traveler. 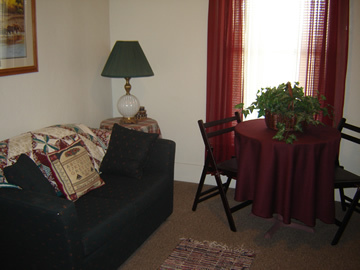 Just off this room is access to our charming balcony with its old-fashioned porch swing and rustic furniture, from which guests get a bird’s-eye view of downtown Gooding or relax with lemonade and a good book.